Statement by some autonomous anti-authoritarian comrades from Wuppertal, Germany about last nights events. Gathering In solidarity with Afrin!, Monday February 26th, 06:00pm (18:00), in front of City Arkaden, Alte Freiheit, Wuppertal, Germany. The repression machine in Germany is developing into a Erdogan-style model. 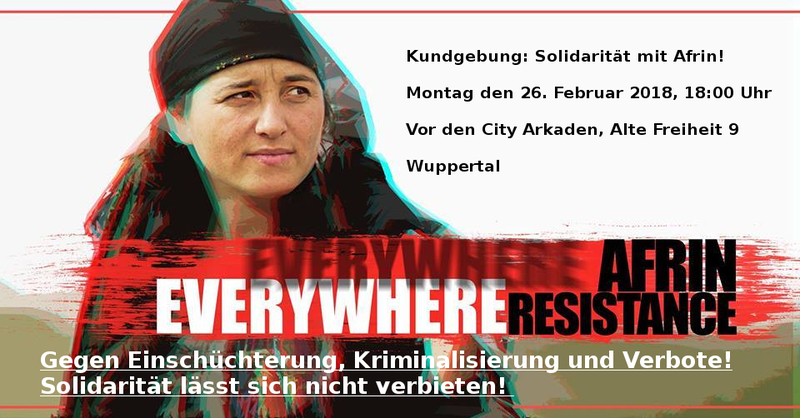 After several demonstrations in solidarity with Afrin were kettled, stopped or even completely banned and police forces, partly masked and equipped with machine guns, raided buildings because of Facebook postings or banners, Wuppertal police forces sieged the autonomous center in Wuppertal (AZ Wuppertal) on Friday february the 23rd and build-up a check point at the Marienstrasse. Enough is Enough! While the German federal government approved 31 arms deals of German arms manufacturer and the Turkish army between December 18, 2017 and January 24, 2018, the same German government more and more increased the repression against people who protest in solidarity with Afrin. Demonstrations in Cologne, Duisburg and Dortmund were banned. The blood on the hands of those who are responsible should not be made to an issue in Germany. On Friday night the autonomous center (AZ Wuppertal) was under siege from police forces. Several vans took position around the autonomous center. There were indiscriminate checks at Gathe and in front of the autonomous center and policemen threatened to detain people who were on the street in groups with more than 3 people. At the same time police cars were permanently patrolling in the Ölberg district. At Marien street they even build-up a checkpoint. At the checkpoint there were indiscriminate checks of people who were looking like “leftwing” people. At Gathe the police was indiscriminately checking youth. The autonomous center had to close earlier as planned on Friday in order to not put visitors at risk. One of the policemen said that the police had seen an antifa flag on a gathering in solidarity with Afrin in the city center of Wuppertal earlier last night. According to the policeman this was a clear indication that autonomous activists had taken part in the gathering. During the gathering allegedly flags with a portait of Abdullah Öcalan, who is imprisoned since February 1999 in Turkey, were seen. The reason for the siege of the autonomous center and the Ölber district that was given by the police man was an antifa flag. For us this situation is totally beyond the pale. For months there are martial performances by police forces because of a few flags or banners. We have had more than enough of this never ending repression. It seems like the German federal government is not only making arms deals with the Erdogan regime but also takes over his authoritarian political style. When turkish PM Binali Yildirim was on his way to Germany he praised the way German police is taking action against the protests in Germany. But the German federal government and it’s authorities should know that they cant ban solidarity. We will not accept the wave of repression and this is also a reason why we will take the streets again in solidarity with Afrin on Monday February the 26th. We will see each other at 06:00pm (18:00) in front on the City Arkaden (Freiheit 9) in Wuppertal, Germany! Against intimidation, criminalization and bans! Some autonomous comrades from Wuppertal, February 24, 2018.